We’re into the waning days of summer, which means that soon the leaves will be changing colour, the days will be getting colder, and hockey will soon return. As the annual Ivan Hlinka Memorial Tournament has now been completed, it’s probably a good time to kick off the 2016 NHL Draft calendar with preliminary, pre-season rankings. The 2016 Draft class appears to be both shallower and deeper than the 2015 class. There’s no Connor McDavid or Jack Eichel here, but there is Auston Matthews – the undisputed top player in the draft. Beyond Matthews, there are a couple bunches (or clusters) of really talented players, and to be honest, there are appealing and talented players down into the latter parts of the second round. The high-end group isn’t nearly as large or talented, but there doesn’t seem to be the drop-off between the beginning and end of the first round group that we saw last year. At least at first blush. There’s a lot of hockey yet to come. Players are listed in the order I would choose them if I had to draft a team from scratch, and are listed with their projected team for the 2015-16 season. Matthews is in a class by himself in this draft. He’s the clear top player right now. He’s headed to the draft via an unusual route: playing a season in Switzerland’s top professional league. He’ll sleep in his own bed every night, play against grown men in a fairly strong league, and then probably go first overall in June. The first cluster beyond Matthews features four very talented young players. Tkachuk, the son of Keith, was a beast for the U.S. Under-18 squad last year, which gives him a slight edge in this group. Fabbro was strong at the Ivan Hlinka tournament (winning gold with Canada), Chychrun has NHL bloodlines and good size, while Puljujarvi has already been playing full-time in a men’s league. Dubois was a great surprise at the Hlinkas, getting better as the tournament wore on. Gauthier was invited to Hockey Canada’s World Junior camp as the only draft-eligible player there, and he used his size and speed well in the exhibition games. Nylander has strong bloodlines – his brother was drafted by the Leafs and his father played in the NHL for years – and has already gotten pro experience under his belt. 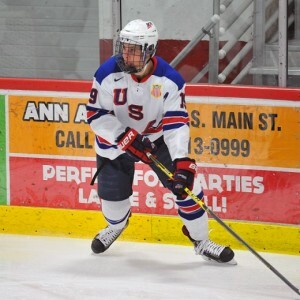 Jones, no relation to Seth, was very good for the U.S. development squad and will head to the OHL this season. Asplund is one of two players with identical names in this draft class; the better one is a forward who captained his U18 national team last season. Neither of these gentlemen were named to the Canadian team for the Hlinkas, despite being prospects with pretty lofty reputations. Despite that disappointment, this is as low as I can comfortably place them, as they are both very toolsy players that seemed to have merely under-performed at the U18 selection camp. By this point, there’s a lot less separation between players and groups. Bean, Krys and Clague are all very promising defensive prospects. Kyrou was arguably the best player at Canada’s Hlinka selection camp and took home a gold medal, as did Howden and McLeod. Sokolov is likely the most promising Russian player, though the unclear nature of KHL/NHL rights agreements push him down the list more than his talent does. Of this group, you could argue that Luke Green, Jonathan Dahlen and Oli Juolevi have the potential to leap-frog into the next grouping up with a solid start to their seasons. In particular, Juolevi’s arrival in North America is exciting for many draft-watchers, as he’s going to be part of a very deep London squad. Samuel Girard really shined at the Ivan Hlinka selection camp and was strong for Canada in the tournament. He doesn’t have stellar offensive skills, but he’s one of the smoothest pure skaters in the entire draft class. Sean Day is a very interesting case. Physically, he’s an absolute monster, and his early physical development earned him exceptional status from Hockey Canada and an early entry into the Ontario Hockey League. He’s got better mobility than he should give his size, and his defensive game is pretty good, but he just hasn’t rounded out yet the way some had hoped he would. He didn’t make Canada’s Hlinka team and didn’t really stand out in that camp. Both he and Charlie McAvoy could move up rapidly if they get off to good starts. McAvoy’s a big addition to an already-good Boston University team. UPDATE: I initially forgot to include Kieffer Bellows, which is pretty crazy given his strong hockey bloodlines and his demonstrated scoring ability last season. He’s just a smidge outside the first round group. 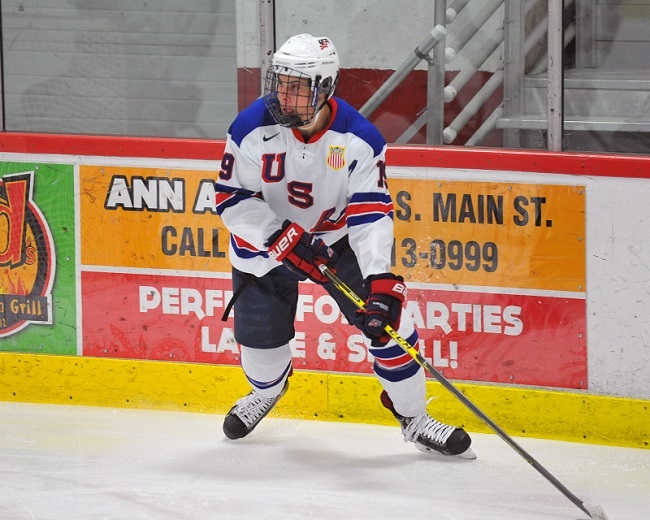 There are lots of talented defensemen in this cluster, along with some versatile forwards. Movarere was quietly very good for Sweden at the Hlinka tournament, while the rest of this grouping represents a great diversity of sizes and skills. Neither Clayton Keller or Alex DeBrincat are big guys, but both of them have put up big numbers in their respective leagues. For now, they’re in this cluster, but keep an eye on them this season. Similarly, Keaton Middleton is a gigantic human being. If he can work on his mobility and offensive prowess, he could be a rising star in this draft class.